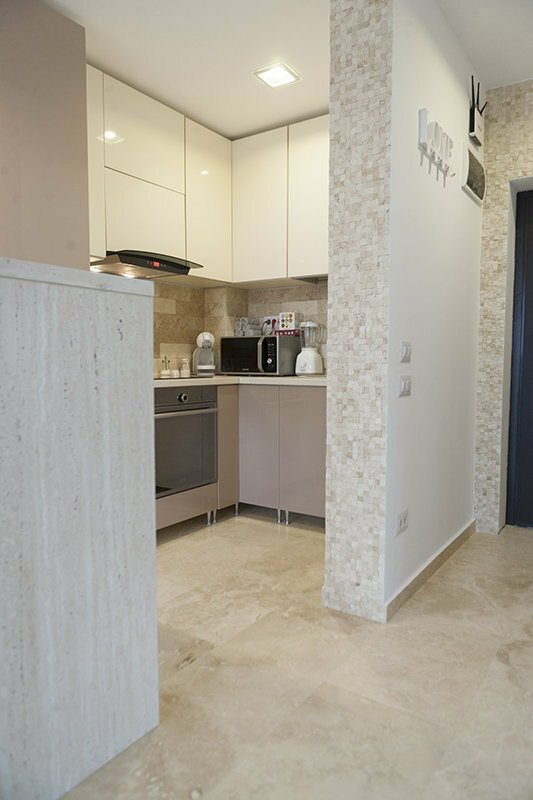 Diana and Silviu fell in love with natural stone when they noticed the travertine decoration during a visit to one of their friends. Their two room apartment is at the top floor of a building in the Chiajna area (SW Bucharest). Attic apartment plus an impressive panorama, it had from the very beginning the potential of their dream home. The next step was the decoration project, a task assumed by both, aimed at creating a friendly, warm and spacious space. 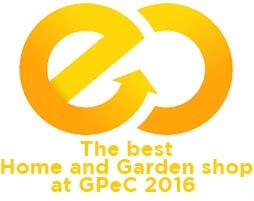 How and when they decided for natural stone? 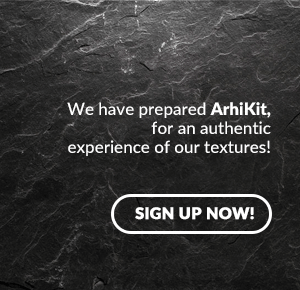 "Basically, we excluded ceramic tiles from the start. 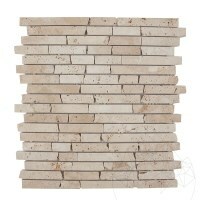 We were visiting a friend when we first saw travertine and we actually fell in love with that stone. 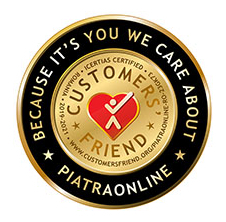 So, we promised ourselves that we were going to decorate our house with natural stone," says Diana, PIATRAONLINE client. The focus of the entire space is on in this direction, since the two were looking for a relaxing decoration from the beginning. 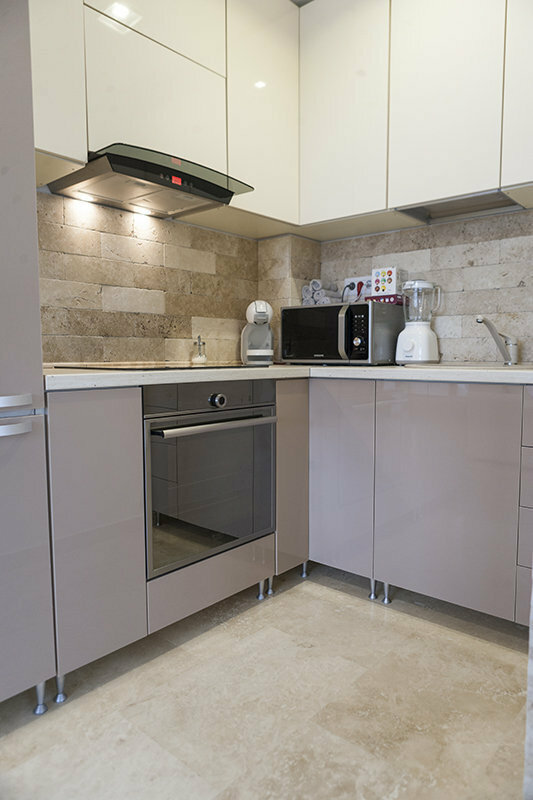 First, they selected the stone for the kitchen, then the furniture, to match the color variation of the space. The kitchen is open, bounded by the living room with a wooden bar and maintaining some simple, classic lines, particular to this decoration project. 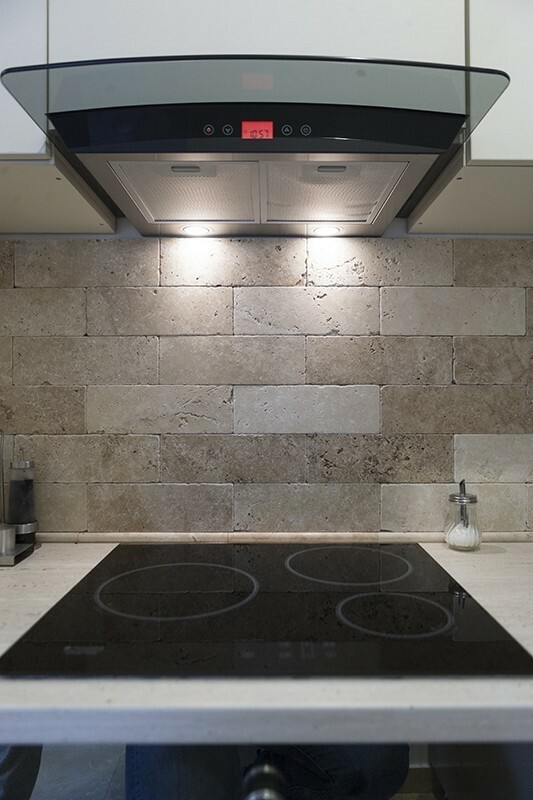 They cladded the kitchen wall with Classic Tumbled Travertine Mosaic, with the flooring of both spaces (the kitchen and the living room) cladded with the same Classic Cross Cut Honed Travertine. The decoration project was extended to approximately two weeks with an exclusive installation team working fast and well. Read also the article on the Amazing private residence in Bucharest decorated with natural stone: impressive bathroom, cladded with SKIN flexible slate! "We found inspiration in our imagination, since we've already pictured our apartment decorated with natural stone by the time this was already empty. 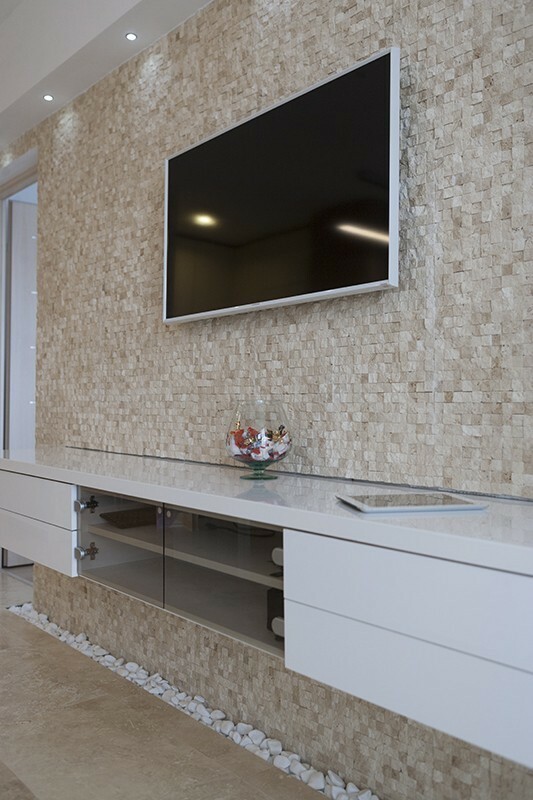 The mosaic from the living room wall – Classic Travertine Splitface 3D Mosaic, was love at first glance for Silviu, I also liked it very much, so I valued his intuition" details Diana for PIATRAONLINE blog. 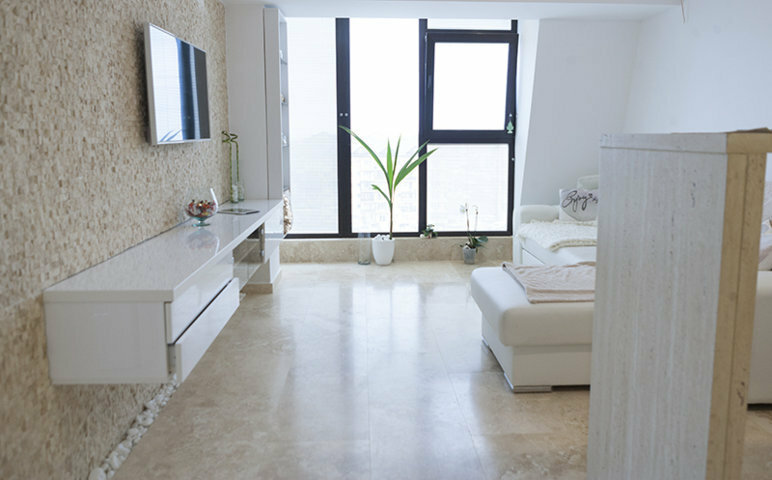 From the very beginning, Diana and Silviu were delighted by one the benefits associated with this apartment: abundance of natural light. The large windows and beautiful panorama enjoyed by both every day have created an excellent setting for natural stone that is so heavily emphasized by natural light. Moreover, the two reinforced the relationship between the stone and light: "Above the living room wall we placed some light spots, very small, with very fine radius, which illuminate the stone perfectly. There are only five light spots, it's an ambient light" adds Diana. 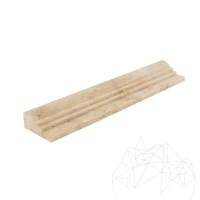 Diana and Silviu bought their stone from PIATRAONLINE showroom. They visited us several times, paid attention to our suggestions and carefully selected the materials according to their wishes: "All we ever bought is from the showroom, we wanted to see with our own eyes, what the materials look like. The showroom looks fantastic, we liked it, and we also bought two bathroom sinks: one from travertine and the other from mosaic." A lot of wood was used for decorating the bedroom, the final result being as simple as possible – Wenge color furniture and similar colors carpentry compared with the rest of the house. 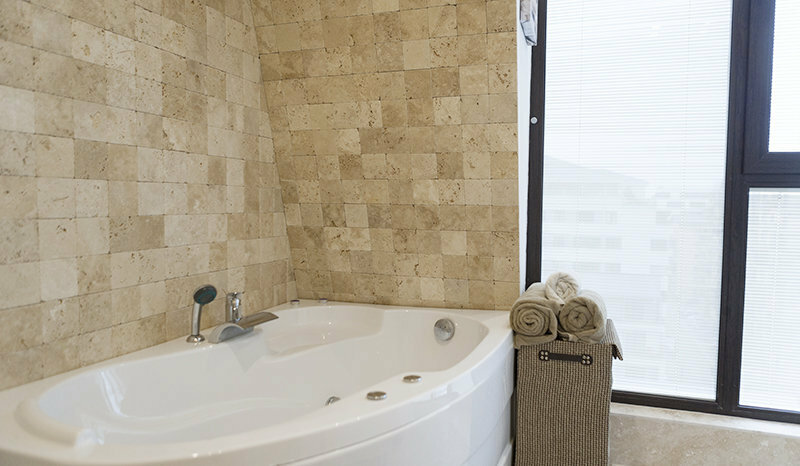 The bathroom walls, also with large windows and abundance of natural light, are cladded with Classic Cross Cut Tumbled Travertine (10 x 10 x 1 cm size). The conclusion? "I am very, very pleased with the final result, although I did not expect it to be so fine. We were first of all very pleased with the high quality materials" mentions Diana. For further details on choosing the stone best suited to your project give us a call at +40318.222.333, or send us an email at export@piatraonline.com!